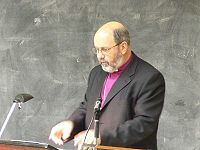 The final post capturing some of the more memorable NT Wright quotes in our 3 day consultation with him. As an aside, I was really impressed with the Bishop. He has an incredible mind that effortlessly recalls Scripture, history, contemporary authors, and influential conversations with the pastors in his diocese. But he is not just a theologian – he is a practitioner. He is on the ground with people loving and learning from them. That is what really made him legit in my eyes. 1 Corinthians 15.58: This is a guiding light for NT Wright. “Not in vain” – this is such a massive statement, and that is because of the Resurrection. You or I might say, “Relax because your future is secure.” But Paul says, “Act now in beauty and love because they matter. Your acts are going to be located in the new future that God will bring to this world.” This isn’t something other than the Cross and Resurrection – this is because of the Cross and Resurrection. Chapter 4: Crushed but not despairing – at the time you felt like you were forsaken and destroyed, which it was like for Paul in Chapter 1. But Paul says this was to get us to rely on God who raised Jesus from the dead. Somehow through that cross bearing discipleship the love of God flows through us and into the world. Matthew 28: “All authority in Heaven and on earth has been given to me, so therefore go…” Enlightenment has taken authority and put it all in heaven and left us here to run the earth. One of the many points brought forward was that the company. 7000 or maybe even much more Frank Muller luxury watches alone. These types of watches can be the highlight of a great holiday season or a reminder of the love a married couple shares. have some fun while searching.